A Man Without a Country is Kurt Vonnegut’s hilariously funny and razor-sharp look at life ("If I die—God forbid—I would like to go to heaven to ask somebody in charge up there, ‘Hey, what was the good news and what was the bad news? "), art ("To practice any art, no matter how well or badly, is a way to make your soul grow. So do it. "), politics ("I asked former Yankees pitcher Jim Bouton what he thought of our great victory over Iraq and he said, ‘Mohammed Ali versus Mr. Rogers.’"), and the condition of the soul of America today ("What has happened to us?"). Born in 1922 in Indianapolis, Indiana, KURT VONNEGUT was one of the few grandmasters of modern American letters. Called by the New York Times “the counterculture’s novelist,” his works guided a generation through the miasma of war and greed that was life in the U.S. in second half of the 20th century. 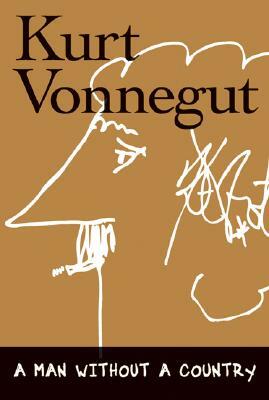 After a stints as a soldier, anthropology PhD candidate, technical writer for General Electric, and salesman at a Saab dealership, Vonnegut rose to prominence with the publication of Cat’s Cradle in 1963. Several modern classics, including Slaughterhouse-Five, soon followed. Never quite embraced by the stodgier arbiters of literary taste, Vonnegut was nonetheless beloved by millions of readers throughout the world. “Given who and what I am,” he once said, “it has been presumptuous of me to write so well.” Kurt Vonnegut died in New York in 2007.